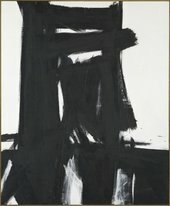 Franz Kline’s late work Meryon 1960–1 calls into question established ideas about abstract expressionism, including its essential ‘Americanness’. Meryon is a large abstract painting made in New York in 1960–1 by the American abstract expressionist painter Franz Kline. It is an example of the bold gestural style and black and white palette that Kline first became known for a decade earlier, and to which he returned in the years before his death in 1962. This In Focus offers the first in-depth study of Meryon, an under-researched but major work in Kline’s career. It explores why Kline returned to his earlier style by considering the significance of the retrospective exhibitions and critical writing his work was the subject of at the time. It also analyses Kline’s choice of title, a pun on the name of a nineteenth-century French printmaker Charles Meryon and the well-heeled commuter town Merion in his home state of Pennsylvania. Finally, it explores the impact of illustration and printmaking on Kline’s work and looks at his relationship with contemporary Japanese calligraphers, notably the Kyoto-based avant-garde calligraphy group Bokujinka. Published in October 2017, the project is authored by AnnMarie Perl (Princeton University) and includes a contribution from Eugenia Bogdanova-Kummer (Emory University).